Velowürks inner tubes are constructed of high quality butyl rubber for excellent air holding characteristics and long service life. 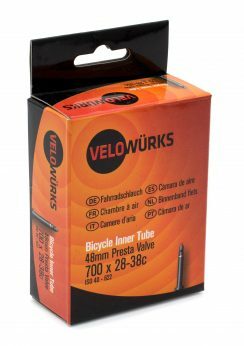 Urban/Gravel inner tubes are available in 0.090mm standard thickness and are offered in a Presta, Schrader and Dunlop valve styles with a variety of valve stem lengths. This entry was posted in Velowurks on October 3, 2016 by Marlow.